CARPE DIEM: UN Data: China Is Now World's No. 1 Manufacturer, But It Requires 9-10 TImes As Many Workers As U.S.
UN Data: China Is Now World's No. 1 Manufacturer, But It Requires 9-10 TImes As Many Workers As U.S. According to new data just released by the United Nations, China surpassed the United States in 2010 to become the world's No. 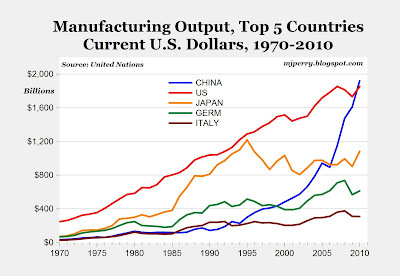 1 manufacturing nation, ending America's dominance as the world's largest manufacturer since the late 1800s (see chart above of the top five manufacturing countries). China's manufacturing output in 2010 of $1.922 trillion and 18.89% share of world manufacturing output of $10.176 trillion,was slightly ahead of America's manufacturing output of $1.855 trillion and 18.24% share of global manufacturing production. 1. China's manufacturing workforce is estimated to be around 100 million and could be as high as 120 million, compared to America's manufacturing employment of about 11.5 million. Therefore, China is producing roughly the same manufacturing output as the U.S. but Chinese worker productivity is so low it needs 9-10 workers for every one American factory worker. 2. 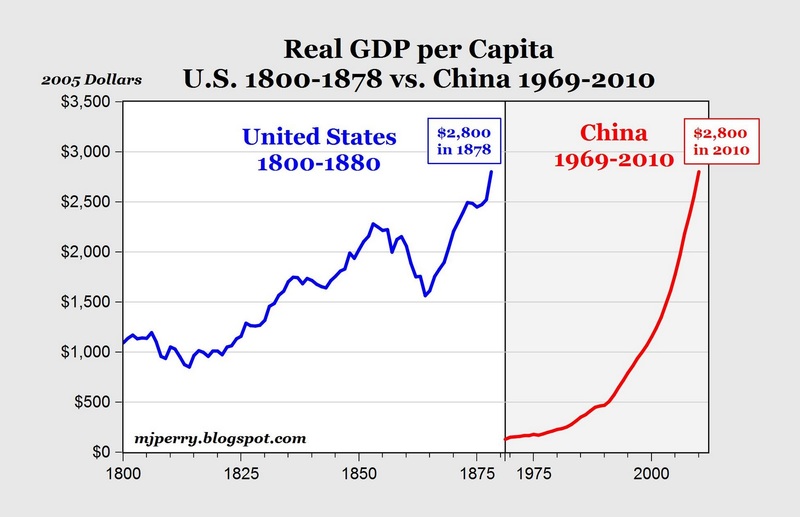 Even though China is now the world largest manufacturer, its GDP per capita of only $2,800 (data here from the USDA) is just now reaching a level of output per person that the U.S. achieved back in 1878, 133 years ago (see chart below). That first chart shows not only a relative but even a absolute decline in Japanese output. A disaster. People braying about a "strong dollar" need to access this chart. How has a strong yen helped Japan? The yen has been the mightiest among currencies--and Japan the weakest among industrial powers. It is the feeble weakling of the last 20 years. They are suffocating under the Bank of Japan tight monetary policies. Sad to see a great nation so radically decline. Imagine what the Chinese could do if they were free to pursue their own goals. Looks like the Chinese know how to create jobs, Obama should take notes. "...the hourly wage in southern China is only about 75 cents an hour. These workers, without factoring in the recent wage increases by some employers, typically earn $200 a month, working six or seven days a week. Beijing announced that it would raise the city’s minimum monthly wage by 20 percent, to 960 renminbi, or about $140...a response to the soaring food and housing prices that have eroded the spending power of workers from rural provinces. ...wage increases here will eventually ripple through the global economy, driving up the prices of goods as diverse as T-shirts, sneakers, computer servers and smartphones." 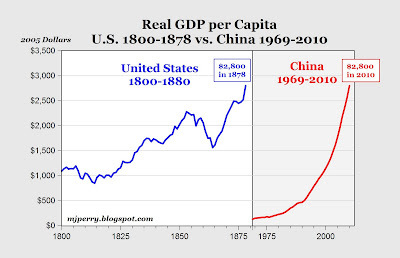 Although, the per capita real GDP growth rates between the U.S. from 1865-75 and China from 2000-10 are similar, the U.S. standard of living likely rose at a much steeper rate. Quote from Benjamin: "They are suffocating under the Bank of Japan tight monetary policies." "Tight" compared to what? Zimbabwe? There isn't a government in the world that doesn't continuously increase it's money supply. Japan is a perfect example of why that doesn't create anything. Oh, if only our money had less value. What a wonderful Orwellian epitaph for Keynesianism. China $ 7,600 2010 est. "How has a strong yen helped Japan? " over the last 30 years, all the periods of best gdp growth in japan have coincided with a strong yen. further, as an importer of most of its energy, japan need a strong yen to keep costs down. the issue in japan is demographic, not monetary. when your population is shrinking and rapidly aging (so your workforce is shrinking even faster) your manufacturing output is going to drop. looking at pure finished good manufacturing output is not necessarily a good metric. if i buy components for $100, assemble them, and sell them for $101, that looks like a lot of gdp, but it's very little actual value added. this is pretty much how the whole chinese electronics industry works. a pc made by lenovo gets called gdp, but all the profit is made made by intel and microsoft. comparing a 3% gross margin $ f sales from foxcon to a 40% gross margin dollar for apple can create a misleading comparison in terms of financial health. "Looks like the Chinese know how to create jobs, Obama should take notes." i do not think this is true. these are jobs no one in the US would want. a burger king employee in detroit makes far more than the guy who made your iphone. eschewing productivity to create jobs is not the way to create prosperity. if it were, we could just ban shovels and make all builders dig with spoons and get rich. As you may knows, output per worker rises continuously in the private manufacturing sector, usually by 2 percent to 5 percent annually. For Japan to suffer a 20 percent decrease in value of manufacturing goods produced annually, despite rising worker productively, is stunning reveserasl of fortunes. Something is deeply wrong with Japan---yet crime rates remain low, work ethic is fine. They have deflation caused by tight money, and a soaring yen---ergo they are suffocating. China has boomed while Japan becomes a backwater nation. China has an expansive monetary policy while Japan has a very tight monetary policy. The village idiot may think a full moon makes the sound of braying dogs---but braying dogs are even more clueless than the village idiot. you are looking at this all wrong. japan's drop came all at once when a bubble (caused by loose money and easy credit) burst. since the mid 90's, manufacturing has been pretty much flat. japan already had one of the most automated manufacturing sectors in the world they are not getting anything like the hilariously overstated productivity gains you claim. and their workforce is shrinking by a like amount. so they roughly offset. they have also seen prices drop and demand for exports like semiconductors and consumer electronics due to the rise of china and been unable to compete on cost. i have shown you about a dozen times that all their best economic periods in the last 30 years have come with a strong yen, and that a weak yen correlates to recession. how can that be so is a strong yen is so bad? don't forget that japan imports almost all its inputs too, so it winds up being a wash. where do you think their iron, oil, wood, and pretty much everyhting else come from? they have had deflation due to a huge drop in demand. printing money would only make them worse off. they are big savers and that savings is going to be needed for the retirees. inflation will just impoverish them. you have this really bizarre economic view that all that matters is gdp as opposed to the welfare of citizens. you seek to erode savings to drive near term consumption, like the keynsian you are (though will not admit to being) while totally ignoring the fact that it was precisely the terribly policies you advocate that got the US into this current mess. they drove record debt accumulation trying to "prime the pump" after the dotbust with outlandishly loose money and created this, a nasty debt bubble that will take a decade to clean up. then, like some sort of one trick pony, you advocate the precise policies that made the mess to get out. you cannot print prosperity. it's never happened anywhere. loose money just begets bubbles and inflation, never real growth. saving and investment is a key part of a sustainable economy. forcibly dumping them into consumption is just a bad quick fix that winds up making us worse off. the yen was flat for 15 years until 2007.
it was 124 in both 2007 and 1991.
it has rallied a great deal since 2007, and guess what? japan has just experienced it's best 4 years of gdp growth since 1995.
so much for your "braying dogs theory". sure, correlation is not causality, but it face it, if a strong yen caused a weak japanese gdp, then the likelihood that a 38% rally in yen would coincide with the best growth in 20 years seems pretty low. all the data is against you here benji. your claims simply do not stand up to the facts. I realize this isn't supposed to be a scholarly publication, but your use of decimal points and commas is very sloppy for an economist and makes it hard for a non-economist to grasp the scope of things. 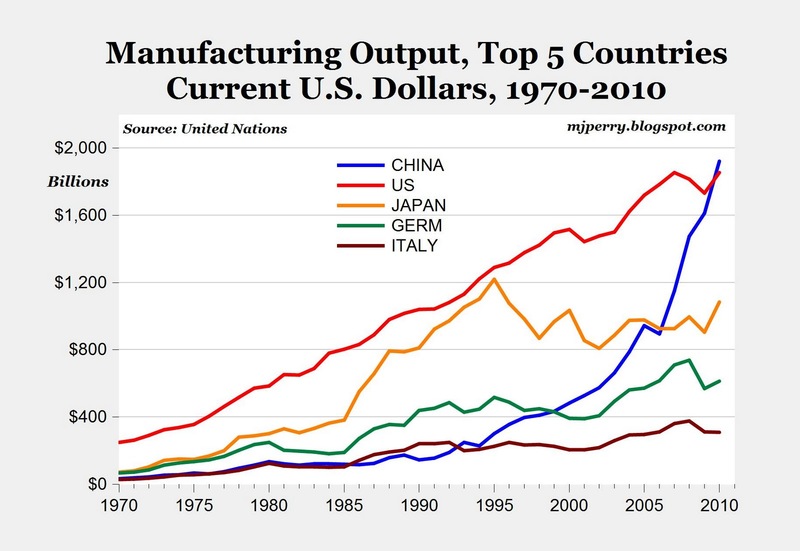 "China's manufacturing output in 2010 of $19.222 trillion and 18.89% share of world manufacturing output of $10,176 trillion,was slightly ahead of America's manufacturing output of $1.855 trillion and 18.24% share of global manufacturing production." The graph appears to show the true scale. Decimal points matter, as do commas (just ask Bob Dole about Newt Gingrich's removal of a famous one in order to protect the no-tax-increase policy of one Ronald Reagan). JM: Because that was an older post, your comment had to be approved, and I hadn't checked the Comments for a few days. Your comment has now been posted, and I have corrected the decimal point mistake I made. I apologize for both my original error, and for not posting your comment earlier. Please consider the fact that I work alone without any support staff or research assistants, and have written 9,000 individual posts in the last five years. As much I try to be error-free, it's always a challenge, and I am frequently corrected by the readers. In this case, the mistake wasn't caught by me or any of the readers, so I thank you for pointing it out. I'll try to do better in the future.